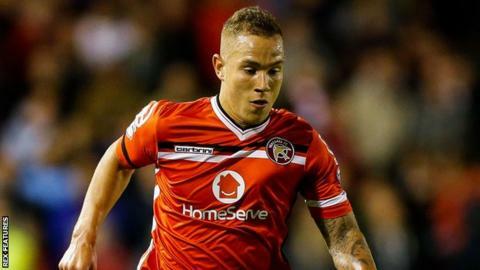 Substitute Kieron Morris scored three minutes after coming on to earn League One promotion-chasers Walsall a point at home against Swindon. The visitors had taken the lead when Michael Doughty picked up a rebound to fire under keeper Neil Etheridge. But Morris cut inside from the right to drill home a left-footed strike. With a game in hand, Walsall remain three points behind second-placed Burton, after their 1-1 draw with leaders Wigan at the Pirelli Stadium. Match ends, Walsall 1, Swindon Town 1. Second Half ends, Walsall 1, Swindon Town 1. Attempt blocked. Kieron Morris (Walsall) right footed shot from the centre of the box is blocked. Attempt saved. Nicky Ajose (Swindon Town) right footed shot from the centre of the box is saved in the top centre of the goal. Attempt blocked. Nicky Ajose (Swindon Town) right footed shot from the right side of the box is blocked. Delay in match Raphael Rossi Branco (Swindon Town) because of an injury. Attempt saved. Jordan Turnbull (Swindon Town) right footed shot from outside the box is saved in the top centre of the goal. Goal! Walsall 1, Swindon Town 1. Kieron Morris (Walsall) right footed shot from the centre of the box to the bottom left corner. Assisted by Paul Downing. James Brophy (Swindon Town) wins a free kick on the left wing. Substitution, Walsall. Tom Bradshaw replaces Milan Lalkovic. Attempt missed. Sam Mantom (Walsall) left footed shot from outside the box misses to the right. Anthony Forde (Walsall) hits the left post with a right footed shot from outside the box. Bradley Barry (Swindon Town) is shown the yellow card. Anthony Forde (Walsall) is shown the yellow card for a bad foul. Goal! Walsall 0, Swindon Town 1. Michael Doughty (Swindon Town) right footed shot from the centre of the box to the centre of the goal. Corner, Walsall. Conceded by Bradley Barry. Substitution, Walsall. Liam Kinsella replaces Jason Demetriou because of an injury. Attempt missed. Michael Doughty (Swindon Town) left footed shot from the centre of the box is close, but misses to the left.